An important part of fiber optic technician training is how to learn safety in the lab or on the workplace. Besides the usual safety issues for construction, fiber optics adds concerns for eye safety, chemicals, sparks from fusion splicing, disposal of fiber shards and more. 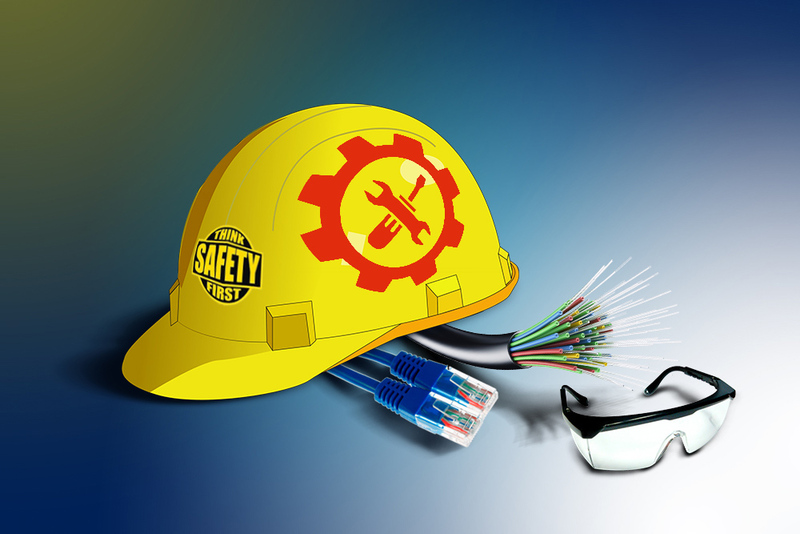 Before working on fiber optic cables, safety rules should be posted on the classroom wall, lab wall or on the job site and reviewed with all onsite personnel. How Safe Are Your Eyes? Usually, fiber optic systems do not have sufficient power to cause harm to your eyes and the light coming out of a fiber is expanding, so the farther you are away from the end of the fiber, the lower the exposure. However, some fiber optic systems have sufficient power to be dangerous and some fiber optic inspection techniques increase the chance of harm. But that’s not the biggest danger facing installers. Fiber optic medical laser systems used for surgery and laser machining systems certainly have enough power to cause harm to your eyes, as well as burn off warts or machine some types of materials. Those systems use very high power lasers, often CO2 lasers, which emit radiation at a wavelength that is really heat not light, around 10 microns wavelength. This wavelength is readily absorbed by materials and can heat them quickly, cutting those materials easily. Fiber optics for communications use much less power. Most sources used in fiber optics are optimized for modulation speed, not absolute power. Can It Cause Eye Damage? Since light comes from the fiber in a cone-shaped beam, your eye cannot focus it on the retina. This is unlike the typical lab laser or laser pointer that shines a narrow, collimated beam that does not spread out – a beam your eye can easily focus on, which may hurt the retina and cause temporary blindness. Are the Fibers Themselves Dangerous? The common risk you may face is getting scraps of fiber in your eye when working with fiber. While few fiber optic systems have harmful levels of power, every termination and splice produces shards (scraps) of optical fiber, which is potentially very harmful to your eyes and skin or may stick on your clothing and be carried to other locations, where it may be harmful to others. It is definitely a must to follow procedures that minimize the dangers to the eye. Always wear protective eyewear with side shields, even if you normally wear glasses, to prevent any flying shards from getting into your eyes. Be very, very careful whenever handling fibers, especially when stripping fiber and breaking fiber extending out of an adhesive connector. Instead of breaking it, scribe it gently, afterwards slide your fingers up the connector ferrule, grasping the fiber and pulling it off. Then dispose of it carefully.